Nervous System. No it’s not what you think, but it may be just as necessary to live. These uber-talented MIT grads with degrees in biology, architecture, mathematics and more, make incredibly beautiful jewelry and housewares based on natural systems. Why is this so awesome, you ask? Because they code these systems and model them using highly functional 3-d software and then print them in precious metals, nylon and stainless steel as well as normal (read affordable) powder and plastics typical of a 3-d printer. 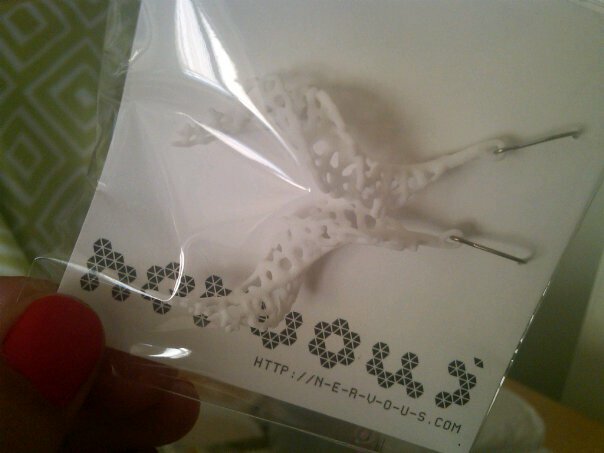 Recently I scored a pair of earrings from their Hypae line from a FAB.com special. They are stunning and easy to dress up, down, either way you’re on the cutting edge (pun intended!). Even the 3-d honeycombed packing made me giddy! Love these guys. Want to be these guys! Someday!